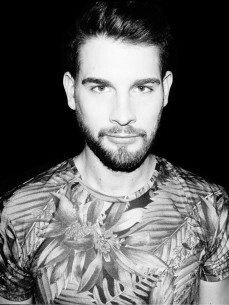 If it comes to passion and devotion to deep undeground house music, Thierry Loesch aka. Riven is one of those Artists that spreads dark grooves through every venue he spins the decks at. His career started back in the early 20 ́s when he discovered an old turntable in his grandfathers basement. He then randomly bought a Vinyl Collection at a Flea market containing a nice selection of classic house vinyl reaching from Joe Smith to Frankie Knuckles. Unknowingly, he quickly developed a deep interest into this style of music which lead him to buy a second turntable and experimented putting the tracks together. After a few years of practicing and after recording his first demo tape which he sent to the local bars, he quickly got his first gig and has ever since been spinning the decks almost every weekend. His residency at the Lauter Unfug events has not left his music unnoticed and lead to gigs at clubs like Tresor, Ritter Butzke in Berlin, Silodom in Saarbrücken and festivals like the Amsterdam Dance Event, Amphitronic and Nature One. Riven ́s passion never stopped at DJ-ing alone. In 2008, he bought his first Desktop PC and a copy of FL Studio and has been producing ever since. After many years of polishing his productions, he had his first release in 2014 on Hush Recordz, followed by releases on Panaché Music and Habitat Music. In 2015 Lauter Unfug joined their forces with Berlin based DJ, Producer, Live-Act and owner of the Label Analogue Audio, Dominik Vaillant to create their own Music Label which has scheduled remixes by Artists such as Kellerkind, Hermanez, Mikalogic, M.In, Daniel Stefanik and many others.